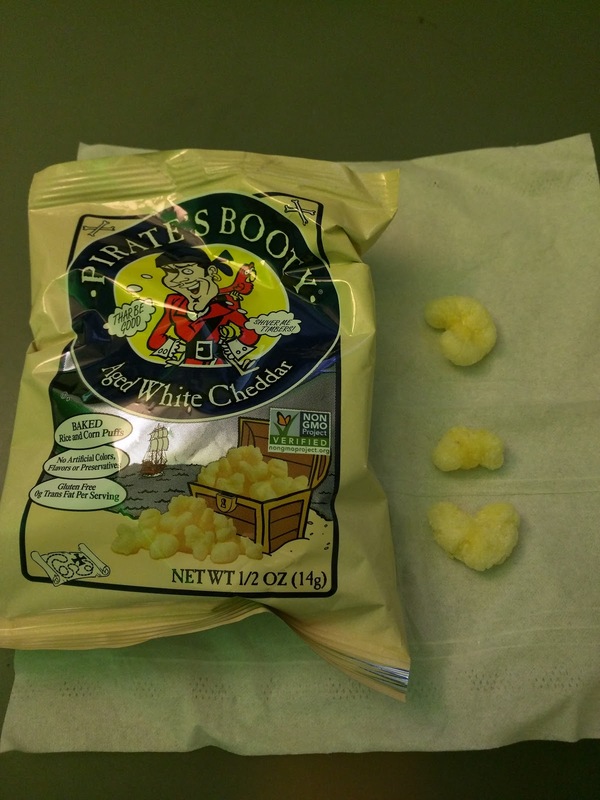 A long time ago, my office used to stock "Pirate's Booty", aka, white cheddar cheese puffs. I liked it as a snack food to munch on mid-afternoon. Ojan REALLY liked it though. Fast forward a few years. I was in the grocery store and saw ... Pirate's Booty Mac and Cheese! Now, Ojan also loves boxed mac and cheese (he's moved on from Kraft Dinner to Annie's). I had to buy this, as it was too perfect. So for Christmas, I gave him a Pirate's Booty themed gift: a box of the mac and cheese and a bag of the snacks. Yes, I wrapped it. I think I was more amused than he was. I was also interested enough to look up Pirate's Booty products. If they make mac and cheese ... what else do they make? Mostly ... just a bunch of puffed corn snacks. They make a handful of snack products, all focused around cheese coating on baked snacks: Smart Puffs, Original Tings, and the line of Pirate's Booty items. I've only ever had the classic Aged White Cheddar pirates booty, but they also make Fruity Booty (!? 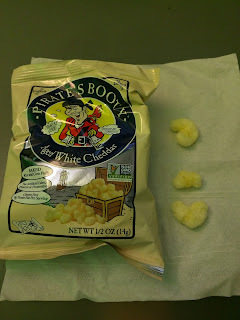 ), Veggie Booty, and "Crunchy Treasures" (the same aged white cheddar as the classic Pirate's Booty, just on a different form factor - silly pirate related shapes like anchors and parrots). The veggie one has spinach, kale, carrots, and parsley incorporated in somehow. The Fruity Booty has berries in it, and, no cheese. Aged White Cheddar Pirate's Booty. "Pirates like their cheddar like they do their rum, aged to perfection. Aged White Cheddar is made from puffed rice and corn, blended with real aged white cheddar cheese and baked perfectly to pirate standards." I really used to love the classic white cheddar Pirate's Booty. But, when I tried it recently to review for this blog, it seemed a lot like Styrofoam packing peanuts. Really airy, not enough crunch. And not nearly as much cheese flavor as I like or remember. Very boring. 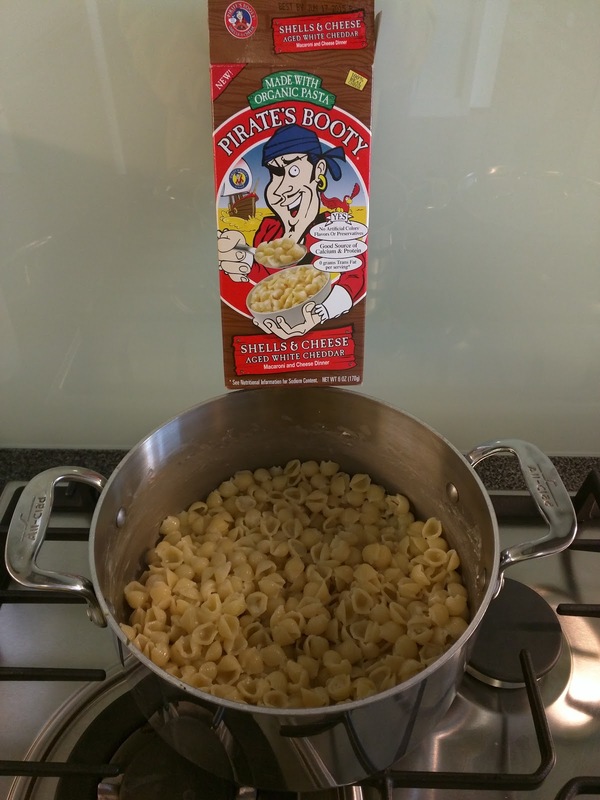 Yes, Pirate's Booty Mac & Cheese is a thing. Fancier than your standard Kraft dinner, made with organic pasta and real cheese. Available in 3 varieties: mild cheddar elbow mac and white cheddar shells, or, uh, anchors. Mild White Cheddar Shells & Cheese. I picked the shells and cheese, because shells are always more fun in my opinion. Preparation was the same as any box mac and cheese: boil water, cooked pasta, drain, add butter, milk, and the cheese packet. Now, to be fair, I never want this sort of mac and cheese. But Ojan loves it, and he was feeling sick one day, and requested it. I obliged the poor sick guy and made his mac and cheese, with a glimmer of hope that I'd like it too, since I do like the Pirate's Booty totally fake cheese flavor. Sadly, it just didn't have much flavor. Like, none at all. I wanted the pasta to be coated in the cheese coating that you always lick off your fingers after devouring a bag of Pirate's Booty (or cheese puffs). Instead, it tasted very plain, quite disappointing. But Ojan gladly finished his whole bowl. Since then however, he's gone back to his Annie's. Noe Valley Bakery is, you guessed it, a bakery in Noe Valley. They make all your standard baked goods, including bread, breakfast pastries, cakes, pies, cookies, and more. The stuff must be good, as they have been in business for 21 years. But that is about all I know about the place, as I haven't actually been there myself. But, I hosted a dinner party and one of my guests came with a box of treats. Note to self: host more parties! You know how much I love desserts, so, I was pretty excited to rip open the box basically as soon as dinner was over. Milky Way Bombe(2): "Flourless chocolate cake, malted chocolate mousse, caramel mousse, Valhrona Croquants, chocolate ganache". Carrot Cupcake: "Shredded Carrots, Pineapple, Toasted Walnuts, Cream Cheese Icing." The Republic: "Stout Chocolate Cupcake, House-made Salted Caramel Bavarian, Irish Cream Buttercream". Red Velvet Cupcake: "Buttermilk Chocolate Cupcake, Cream Cheese Icing". 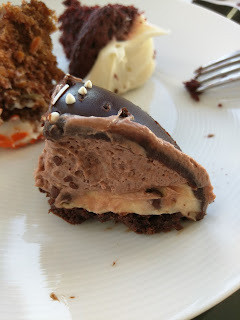 Chocolate Fudge Cupcake: "Devils Food Cupcake, Old Fashion Fudge Frosting, Sprinkles". Chocolate Caramel Fleur de Sel: "Devil’s Food Chocolate Cupcake, House-made Caramel Bavarian, Chocolate Ganache, Grey Sea Salt". The box had 5 different cupcakes and 2 Milky Way Bombes. We also had 6 people who wanted to try basically everything, So, rather than forcing choices, we cut the selections into 4 chunks each (smaller just didn't seem possible). 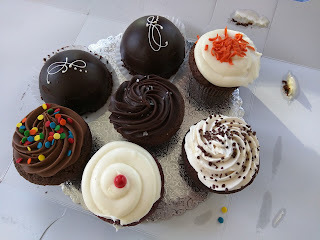 I missed out on the filled cupcakes (The Republic and Chocolate Caramel Fleur de Sel), but tried all others. All of the cupcakes were decorated differently, with some kind of garnish on top, a touch I appreciated. The first item I grabbed was the carrot cupcake. I love good carrot cake, but I know I have strong preferences for my carrot cake, as my Great Aunt makes a "famous" version that pretty much no other version lives up to (the only one I've found is the carrot cake from Flour & Co, which, um, is even better than my Great Aunt's!) Noe Valley Bakery's was ... fine. The cake was moist. It had shredded carrot inside, and I guess some pineapple and walnuts, although I didn't really detect either of these elements. It didn't have much spicing. The frosting was classic cream cheese icing, soft, fluffy, and pretty good. The candied carrot garnish was cute. Overall, it was absolutely fine, but not particularly exciting. The next cupcake I grabbed was Red Velvet. It had the same cream cheese frosting as the carrot, and a garnish of a little red dot. The "red velvet" flavor was actually quite good, I was impressed. It had a real buttermilk tang, something so many red velvets do not have. I also appreciated that it had a slightly crispy top. I always like that contrasting texture. Finally, after the others had polished off the chocolate filled cupcakes, I had the final chunk of the final chocolate selection, the non-filled Chocolate Fudge Cupcake. I'm just not one for chocolate cakes, so I mostly ignored the chocolate ones, but, I'll admit, this was a decent chocolate cake, very rich dark chocolate flavor (I guess Devil's Food IS more than "just" chocolate). The frosting was pretty classic, good, chocolate frosting. Overall, all the cupcakes were fine, but, I wouldn't go running back for more. Then again, I'm not usually that big of a fan of cupcakes (or cake) anyway. I need to be in the right mood to really want cake. "Flourless chocolate cake, malted chocolate mousse, caramel mousse, Valhrona Croquants, chocolate ganache". The Milky Way Bombe however was another story. A very unique item, and I'm glad our guest brought two of these! The base was flourless chocolate cake, a thin layer, as you can see here. It was moist, but not particularly dark or rich. On top of that was the layer of caramel mousse, a lighter color than the malted chocolate mousse above it. It was fluffy and sweet, but I didn't know it was "caramel". The malted chocolate mousse was great, really creamy, fluffy, smooth, pretty much perfect chocolate mousse. The entire thing was coated in a thick layer of rich chocolate ganache. I really liked the chocolate mousse and the ganache, and would happily just eat a bowl of the mousse. The Bombe was certainly best to share, as it was pretty rich. So, I had never visited a Chipotle before now. I'm not against chain restaurants, but, Mexican food is rarely at the top of my list, so I just have never had a reason to visit. The fact that they have had some interesting, uh, problems this past year certainly didn't help encourage me to prioritize a visit. To Chipotle I went, with Ojan in tow. 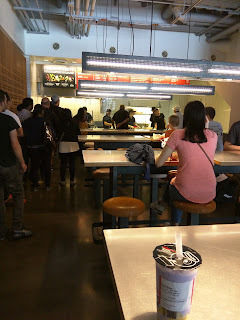 (Really, I went for him to have Chipotle, and for me to try a bite and experience the whole thing. I had no real plan of eating there, just because it isn't the sort of cuisine I like). Overall, it was exactly as I expected: higher quality than standard Mexican fast food (a la Taco Bell), but no where near the cailbre of fast-casual Rubios. I wouldn't go back, and I doubt Ojan would if we were in San Francisco, but, if travelling, and needed fast food that wasn't burgers, it seems like a reliable option. And no, we didn't get sick. If you are new to Chipotle as I was, let me review the menu for you. The menu is not very extensive. First you decide HOW you want your item: a burrito, tacos (crispy corn, soft corn, or soft flour), as a "bowl" (burrito sans wrapper), or a salad (like a bowl, but with dressing and more lettuce). 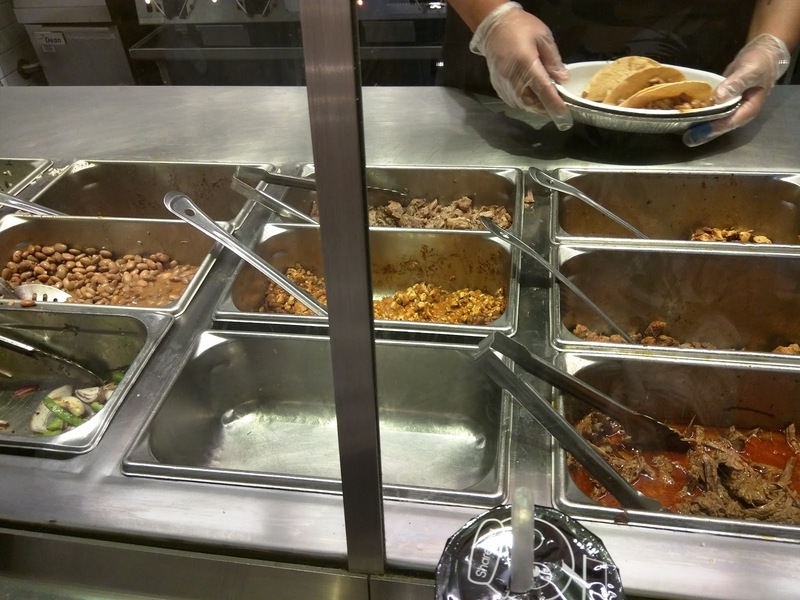 Then you pick your protein: steak, chicken, carnitas, barbacoa, or sofritas. 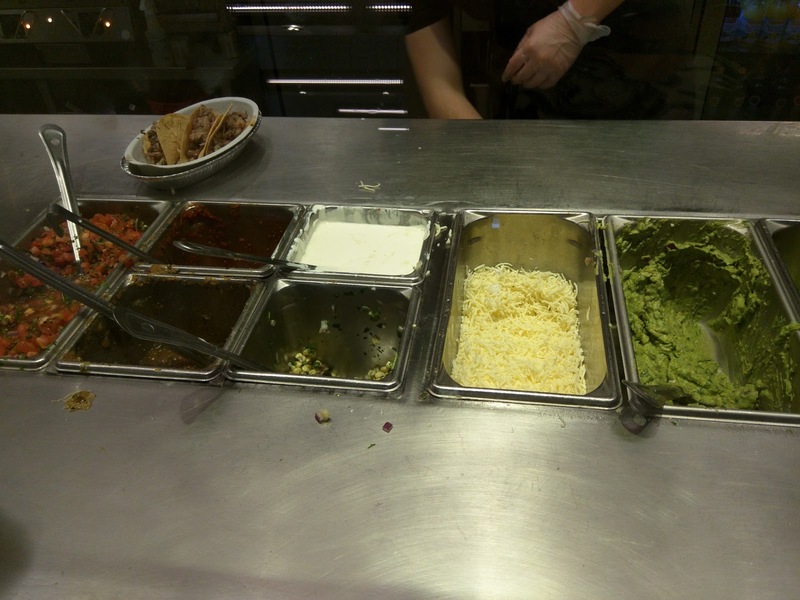 Then the fillings: rice (brown or white), beans (black or pinto), salsa (mild tomato salsa, hot red-chili salsa, medium-hot tomatillo green chili salsa, or medium roasted chili-corn salsa, fajita veggies, and optional toppings (sour cream, cheese, lettuce, or, for a fee, guac). Pricing is the same no matter which form factor you choose, as the price is set based on the protein, aka, a steak burrito is the same price as a steak salad, but, a chicken burrito is cheaper. Besides the burrito/taco/bowls, the only other items on the menu is a kids menu with quasadillas, and the side dish of chips and salsa. 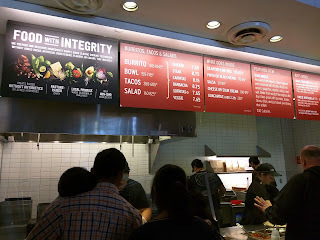 I visited the Chipotle adjacent to the Metreon. It was fairly busy. We got in line, which moved quickly. Once at the front, you move assembly line down the counter, starting with picking your option (burrito/bowl/tacos) and ending at a register. Basically, Subway, but, burritos. After you make the choice of base, you need to pick the protein. All of the proteins are sitting there in heat wells. Given the volume of people moving through, I imagine these are replenished relatively often. After the protein and beans are added, your order is slid down to the next worker, who adds on the salsa and other toppings. Things move right along. 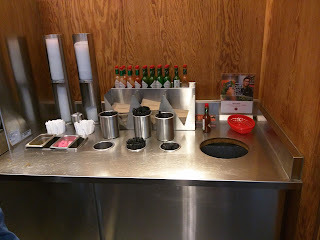 On the side is the finishing station, with plastic cutlery, napkins, sugar, and ... tabasco (both red and green). 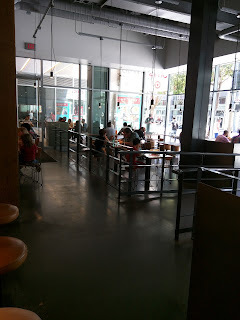 Seating isn't particularly interesting, several types of tables in the light-filled interior, and a few smaller tables outside on the sidewalk. We ate outside since it was a lovely day. "Fill three crispy corn shells with your choice of meat or sofritas, salsa, guacamole, sour cream or cheese, and romaine lettuce." Ojan opted for the crispy tacos, which come as a trio. You must pick a single protein for the filling for all three, no mix and match (lame). He opted for the carnitas: "seasoned with salt, cracked black pepper, juniper berries, thyme, and bay leaves. Braised and shredded by hand throughout the day, resulting in tender meat with concentrated flavors." To this he added pinto beans, medium tomatillo green chili salsa, cheese, and sour cream. 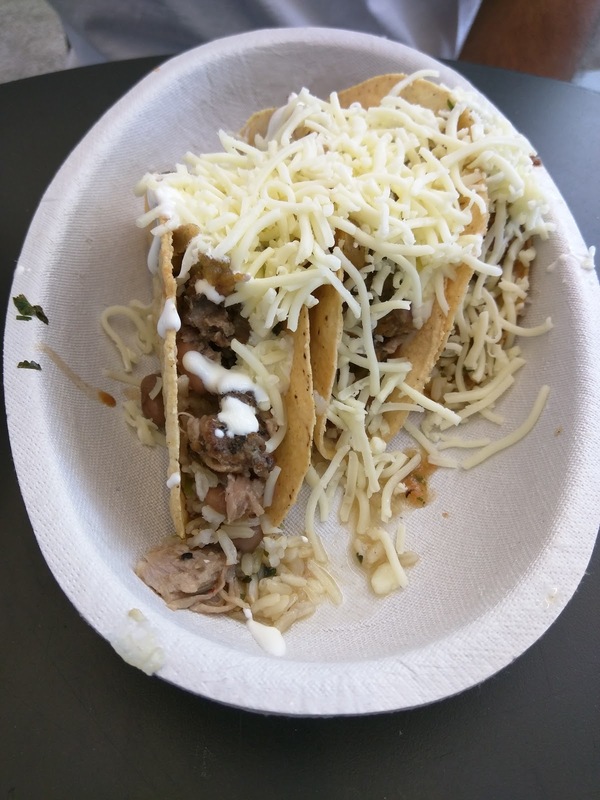 The tacos didn't exactly look pretty (particularly the cheese just kinda thrown on top), but, who am I to judge based on looks? I took my requisite bite. Well ... it was a taco. Standard crispy shell (not stale). The cheese was ... cheese, blended white cheddar and Monterrey Jack. The sour cream was ... sour cream. I appreciate that those items are included standard and not an upcharge. The carnitas tasted kinda like chicken to me, but, Ojan commented several times that he was impressed by the quality of the meat, not greasy, not gristly, not chewy. The salsa didn't have much flavor, but also isn't the one I ever would have chosen. So, to me, fairly lackluster, but, for fast food tacos, obviously better than the competition. 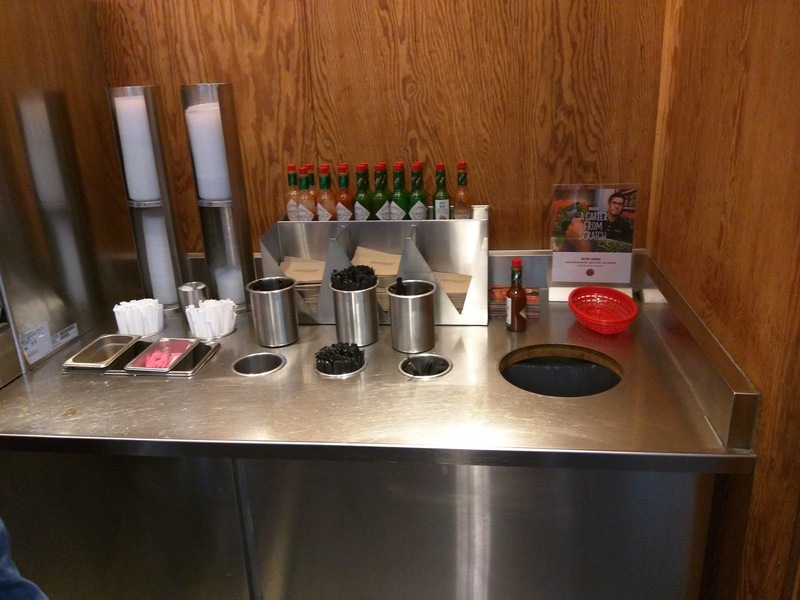 But, in San Francisco, why would you ever go here over a real taqueria? The price isn't any better, and, although the ingredient quality is, the flavor is just much better in more authentic food.